This article is focussed on a very young talented professional female tennis player from Russia - Marta Sirotkina. Having won 7 ITF singles and 6 doubles titles, she is the gold medalist of 2009 Russian Championship. Profile, career and records of this player are also given here. Marta Sirotkina is a female professional tennis player from russia. 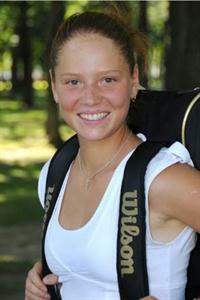 This 20 year old russian player has won 7 ITF singles and 6 ITF doubles tournaments. A right-handed with two-hand backhand style, she is also the Gold medalist in 2009 Russian Championships. Born in Moscow (Russia), Marta is still very young and has a long career ahead, but she has already proved herself as a very good player in ITF tennis circuit. She become professional in 2007, but won her first career title in 2010 at Ain Elsokhna-Suiz. She won three more titles later in the year at MAdrid, Antalya and Dubai. All these were ITF circuit level tournaments. 2011 has also been very good for her, as she has already won three more titles. First was AEGON Pro Series at Bath (Great Britain). Second was at Antalya (Turkey) and third at Bangkok (Thailand). Her current WTA Ranking in singles is 218, which is also her career best ranking. Marta is also a very good doubles player. She alredy has won many doubles tournaments at ITF circuit. Her first title comes at St. Petersburgh (Russia), where she partenered Yuliya Kalabina. Her career best ranking in womens doubles is 233.